Saturn is the sixth planet furthest away from our Sun, it is the second largest planet after Jupiter in our Solar System and it is named after the Roman god Saturn. The planet is probably best known for having a beautiful ring system surrounding the planet. Although other planets in the solar system such as Jupiter, Uranus and Neptune have ring structures, the rings around Saturn are by far the clearest and most striking of all the planets in the solar system. Saturn is the second largest of the four gas giant planets and we do not have a very good understanding of many aspects of the planet. Only four of our spacecraft have studied Saturn as part of fly by missions and there are still many questions to be answered not only about the planet itself but also the rings that surround it. Let’s find out more about Saturn. Saturn has an average radius which is 9 times larger than the Earth, has only 1/8 of the average density of Earth and the mass of Saturn is 95 times that of the Earth. Wind speeds on Saturn can reach an amazing 1,800 km/h. Saturn is approximately 1.4 billion kilometres from the Sun. Saturn makes one full orbit of the Sun every 29.41 Earth years and makes a full rotation every 10 hours, 13 minutes and 59 seconds. The orbital speed of Saturn is 9.69 km/s. 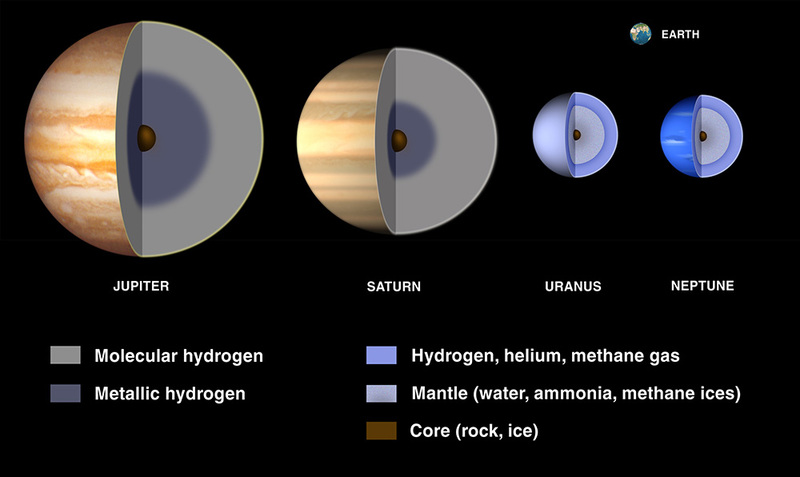 Inside Saturn and the other ‘Gas Giant’ planets. Saturn has nine rings which are composed mainly of ice particles, rocky debris and dust. The debris can range in size from a mere centimetre to several meters. We do not currently know why Saturn has rings like it does although there are two current theories. The first is that the rings were made when one of Saturn’s moons was destroyed. The second theory is that the material to make the rings was left over material from when Saturn was first formed as a planet. Saturn’s rings are 6,630 km to 120,700 km above Saturn’s equator and they average approximately 20 metres in thickness. The rings were discovered by the famous astronomer Galileo in 1610. There are 62 known moons orbiting Saturn, only 53 have been officially named. Only six of these moons are icy and are similar to the Galilean moons of Jupiter, these are Mimas, Enceladus, Tethys, Dione, Rhea, and Lapetus. Titan is the moon that is an odd one out because it has a thick atmosphere. Titan is the second largest moon in the solar system, second only to Jupiter’s Ganymede (larger that Mercury itself) and the only one to have a thick atmosphere. The atmosphere is roughly 90% nitrogen and 10% other molecules such as methane and it is the only place in the solar system that we currently know about that has a similar atmosphere make up to the Earth. Saturn is not a dense planet and because of that it doesn’t have much gravity. It is thought that due to the makeup of the planet if you were able to theoretically place it in enough water the planet would float. 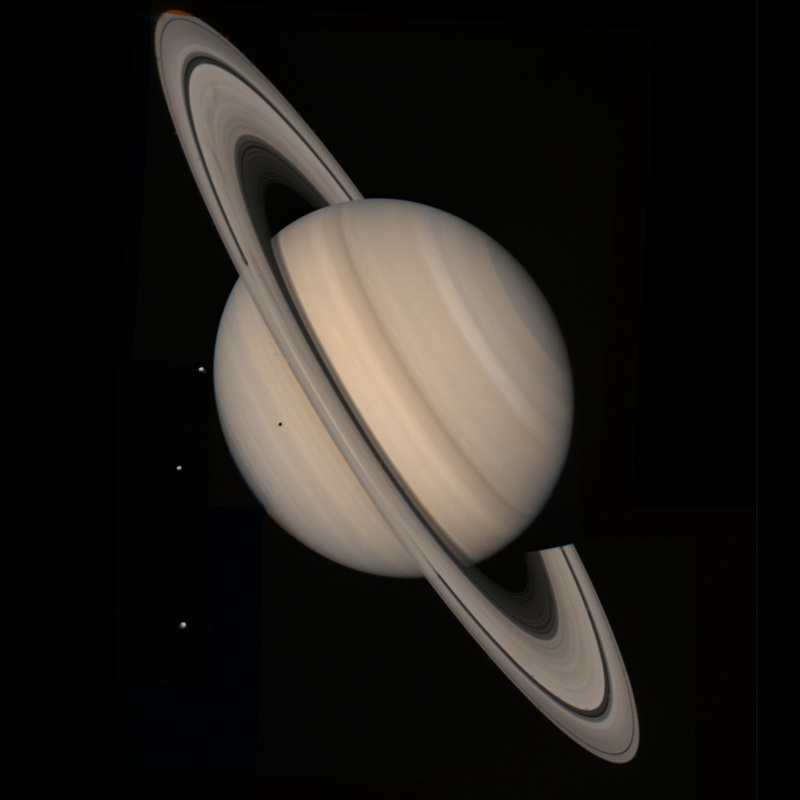 Saturn is one of five planets that can be viewed in the night sky with the naked eye but to see the rings you would need to look through a telescope. 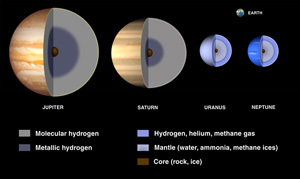 We do not know exactly the facts about what Saturn’s internal structure is like but studies suggest that Saturn has a small rocky core surrounded by a metallic hydrogen layer followed by a liquid hydrogen/helium layer and an atmosphere reaching out 1000 km. The atmosphere of Saturn shows banded elements similar to those on Jupiter but slightly lighter in colour and nearer the equator of the planet. In the same way that Jupiter has the Great Red Spot, Saturn displays a Great White Spot every 30 Earth years near the Saturnian northern hemisphere. 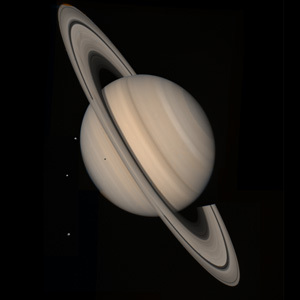 Saturn has been visited by the Pioneer 11 spacecraft in 1979 as well as Voyager 1 in 1980, Voyager 2 in 1981, and the Cassini Huygens probe in 2004. All have been fly by missions. There is lightning on Saturn which is 1,000 times more powerful than the lightning found on Earth. Saturn’s shape can appear as if the top and the bottom have been squashed together slightly. The distance to the poles is 54,000 km, but the distance from the centre to the equator is 60,300 km this proves that the planet has an appearance of a flattened ball. The reason for this is the speed with which the planet rotates. A similar feature can be found with Jupiter also.